Virtually every traveller to Jaffna takes the opportunity to indulge in a well-known sugar high at a famous spot to visit. Invariably, they will sit on one of those polished brown chairs digging into sugary ice cream at the famous outlet just behind the Nallur Kandaswamy Kovil. Even our prime minister makes the customary trip to Rio Ice Cream without which a visit to Jaffna would be incomplete! But when Prime Minister Ranil Wickremesinghe visited the ice cream parlour in February, he may not have glanced towards the kovil. If he had, he’d have seen another memento from Jaffna’s recent history – in fact, from its violent past. Look carefully outside Rio, on the side of the Point Pedro Road, and you will see a memorial that looks a little like an abandoned water fountain. On that February night, when I visited the ice cream parlour a few hours after the premier had left, there was no mistaking what the memorial stood for. It was decked in flags of red and yellow – colours of the Tamil Tigers, which were omnipresent in this part of the world 15 years ago. The monument, which is known as the Thileepan Memorial, stands on the spot where the eponymous young university student – an ardent supporter of the Tamil Tigers – died while on a hunger strike in September 1987. When I visited the same place two decades ago, the memorial had been razed. During subsequent visits, I saw it built up once again and embellished with a cardboard cutout of the Tamil Eelam map with a large picture of Thileepan emblazoned on it. And then the monument was razed once again. Its status is dependent on the country’s political tide. 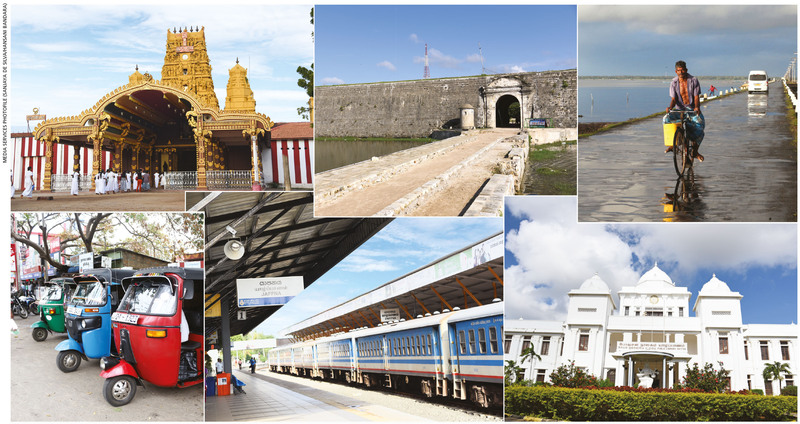 Since my first visit to Jaffna 20 years ago, the city has been transformed and is now completely different. Gone are the suffocating security checkpoints and overpowering military presence. Swanky hotels are coming up in their place. One of the places that has always piqued my imagination is the old Dutch fortress like mansion that lies just across Kachcheri. Since it was no longer overgrown, I decided to take a look inside. As I moved closer, I realised there was a massive security contingent in place as sundry officials were preparing for the prime minister’s visit. Regrettably, no one had thought it fit to restore the centuries old Dutch building as an archaeological site and make it accessible to the public. Some of the old houses down the lanes here have been restored, and converted into boutique hotels and apartments – they now constitute popular real estate. The youth in Jaffna talk about the latest Tamil movies and film stars rather than dream about becoming Tamil Tiger militants. On a visit in 2002, I remember looking around Jaffna and Vavuniya, and seeing youth dressed in balloon trousers, which was the preferred style of the Liberation Tigers of Tamil Eelam (LTTE). These days, the youth wear tight jeans and bright T-shirts as they busily take selfies. And the ubiquitous bicycle is being replaced by annoying scooters that crisscross the cityscape. I once spent several days in Tiger territory and then crossed over to Jaffna. One of the main needs for some in my group was to find cool beer, which was a rarity in Kilinochchi in those days… though for a while during the ceasefire, there was a place that did sell beer. We converged on the first floor of the Bastian Hotel, beer in hand; we were in heaven it seemed. Near the fort as dusk falls today, there are men both young and old sipping strong beer laced with hard arrack. There are also occasional reminders of Jaffna’s violent past. On the road to Point Pedro, we suddenly encounter a military checkpoint akin to those that were so common in the past. We were told that since the road runs through the main military camp, we had to take a tedious detour. Jaffna has always held a mystical charm for me. After my first visit, I compared the potholed road to a yo-yo. I told a friend it was ‘yo-yoed harmony’ and she thought I’d lost my marbles. Every junction and lamppost seemed to possess a violent footnote. On that first visit, I was sipping lime juice while looking out of a window on the first floor of a house used by an aid organisation, all the while nervously glancing at the barbed wire checkpoint on the road nearby. Then after the war was over, I hitched a ride on a bus full of ‘war tourists.’ The bus tour was organised by a temple society and I strolled along with elderly ladies, all dressed in white as they walked in single file. They were not walking to a temple but to have a look at Prabhakaran’s ancestral house in Valvettithurai. The influx of southern tourists became such a problem that the authorities eventually razed the structure. Jaffna is a changed placed with neon lights dancing in the night and couples holding hands as they stroll at sundown. There’s loud music emanating from the shops, replacing the Tiger propaganda songs of the past. I must say it sure did.